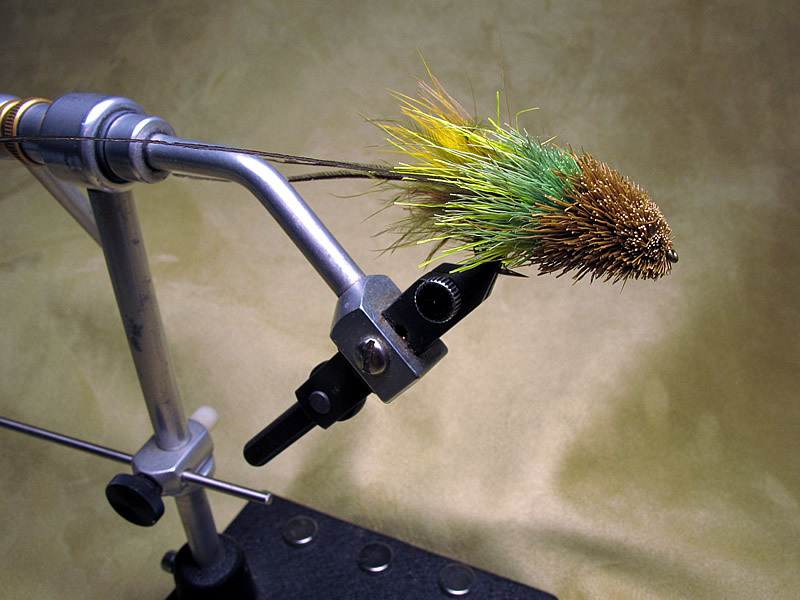 Yes, it is a marabou muddler (mixed olive and yellow), with the first deer hair colour in a constrasting green. Underneath is a little red yarn and most pf these are now tied with a long peacock and saltwater flashbou tail. Q: How do I fish it? A: On the swing, on or just below the surface, particularly over pool with large boulders or an pool with a sharp ledge edge, so the intent is to pull up those fish hiding in hard cover. Just like any good swing, you control the mend to generate the wake, the light and the movement you want. I will use light sink-tips to help it dart on-off the surface. Please note that I reference an objective rarely stated in fly-fishing. I am as much interested in how I alter and distrub the light in the pool, the changes in reflection. I do not have rules or guidelines, but I am thinking hoes does the wake and the reflected light from this, signal the fish ahead, something is coming.